At VOCES, our mission is to change the lives of children. After more than 11 years of providing speech-language services, we understand the challenges for bilingual children and their families – and we’ve mastered providing therapy that produces results. We are committed to preventing over enrollment of bilingual children in special education. Latino children are 4 times as likely as White children be identified as needing speech therapy (Hosp and Reschly, 2004). This over-identification is paired with an astonishing low number of bilingual speech language professionals: Of over 161, 000 individuals represented by ASHA, less than 7,000 are certified Bilingual SLPs (ASHA 2012). 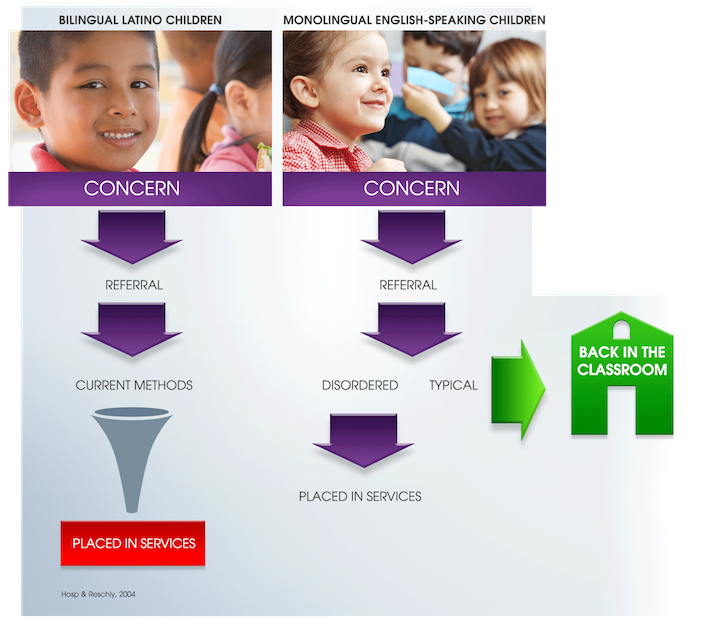 Bilingual Latino children referred for assessment are more often funneled into special education services than their monolingual, white peers. At VOCES, our approach seeks to change the over-enrollment in special education with specialized and cutting-edge evaluation in the child’s native language. Real change is possible on an individual level when clinicians take responsibility and ensure bilingual children are evaluated correctly. There is a huge lack of knowledge about working with bilingual students. With my experience working with bilingual children, I and my VOCES colleagues are uniquely qualified to educate teachers, parents, and whoever wants to listen about the effects bilingualism can have on development, red flags indicating a potential speech or language delay, and effective ways of supporting bilingual children with speech or language delays. There are so many school staff members and parents that simply do not have this knowledge, and I’m inspired to change the lives of bilingual students.